This entry was posted on May 16, 2013 by seekraz. 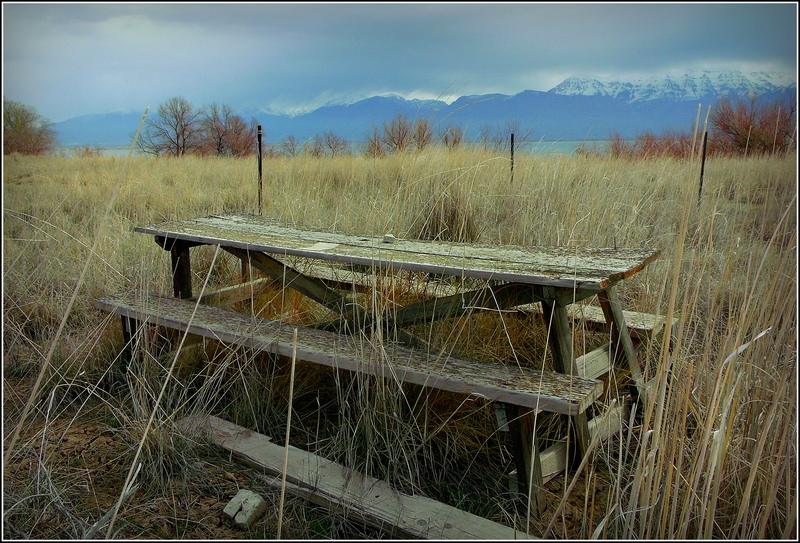 It was filed under Photos - Outdoors and was tagged with abandoned picnic bench, photography, seekraz photography, Utah, Utah County, Utah Lake, Utah photography. Not all that bad, after all! I can well imagine a rather informal trail lunch here! I rather enjoy it, too, Gary…seems to be an appropriate place for a trail lunch…if it were a little sturdier, certainly…but it does have a fantastic view…. A bit of wide open space with your lunch perhaps? I feel sad when I look at this picture, like the picnic table used to have a family that came to play around it and eat on it. The family left the table here, perhaps because it was too big for the moving truck, or it was forgotten about. I want to give the table a hug and then make it usable again. Kelly, we think alike in regard to that table that was left behind by someone. I just wanted to let you know. Have a nice weekend. And maybe they were going on to bigger and better things and left the table for us passers-by…to have a place to sit and wonder about them…while loving that view……maybe…. Thank you, Kat. Certainly looks like you wouldn’t be disturbed. Lovely picture Scott. It used to be for someone. Not a bad choice. I’d picnic there…might wipe it down a bit first! Oh, that would just mess it up, Susan! Very nice image, Scott, although I would hate to sit at that seat with bare legs. I can only imagine the splinters of wood working their way into one’s skin. Strange to think how folk would once have sat here to eat, but how quickly nature takes back control. It’s a reminder of how quickly time passes. An unexpected reminder, too, Andy…I like your insight. This is a great shot, Scott. I love the composition and textures, and I sure wouldn’t be unhappy to sit a spell and take in the view. Is that a lake out there? Thank you, Yvonne…I’d like a little more shade for my picnic, but it suits me just fine for a nice resting spot. If only that table could talk!!! I loved reading the comments and how people felt about this shot. I’m sure it would have some stories to tell…. The bench makes me think that if someone tried to sit on it, it would collapse sidewards! Love the gentle colours in this shot. I think you’re right, Meanderer…it’s seen better days, for sure. I’m glad you enjoyed the colors, too….they’re some of my favorite.